In 1926, American swimmer Gertrude Ederle became the first woman to swim the English Channel. The feat had been completed by 5 men before this, but Ederle not only completed the swim but beat the record, set by Enrique Tirabocchi in 1923, by more than two hours. Born on October 23, 1905, in New York City, Gertrude Ederle was one of five children born to German Immigrants, Henry and Anna Ederle. She learnt to swim when she was nine years old, after she almost drowned in a pond, and she then spent most of her time at the local public pool and summers in the water at the New Jersey beach. Having left school to focus on competitive swimming, 17 year old Ederle competed in the 1924 Olympic Games in Paris, where she won three medals, and by 1925 she had set no fewer than 29 swimming records. It was that year that she would begin training to swim across the English Channel. In June 1925, in what would later be considered as a warm up, Ederle broke the men’s record for the time taken to swim the length of New York Bay, and that same summer she made her first attempt at crossing the English Channel. But, disappointingly, after swimming for just shy of 9 hours, her coach, Jabez Wolff, forced her to stop, concerned that she was swallowing too much water. Ederle subsequently fired Wolff and hired Thomas William “Bill” Burgess, who had become the second person to successfully complete the English Channel swim in 1911. A year later, on the 6th August 1926, Ederle was preparing to try again. The weather was inclement and bookies had given odds of six to one against Ederle succeeding, but Ederle was resolved. Wearing goggles and a two piece red swimsuit, both of which she had designed herself, she stood on the shore of Cap Gris-Nez as her sister smeared her with lanolin, petroleum jelly, olive oil and lard to protect her as she swam. Given that only a few years earlier the Women’s Swimming Association in the US, that Ederle had been a member of since she was 12, had been calling for the Amateur Athletic Union to “allow [female] swimmers to remove their stockings for competition”, this vision of Ederle, standing resolute and stocking-free in her two-piece red swimsuit, is a powerful one. 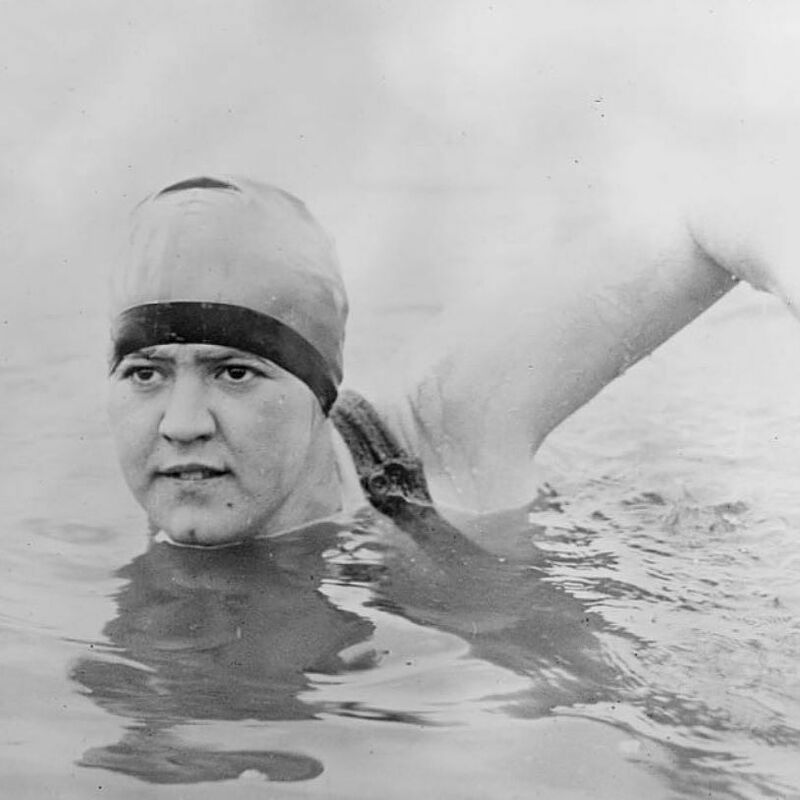 9:04 pm, after 14 hours and 31 minutes in the turbulent water, Gertrude Ederle reached Kingsdown in Kent, becoming the sixth person and first woman to swim successfully across the English Channel and beating the previous record. After her success she said: “I knew it could be done, it had to be done, and I did it”. Ederle’s accomplishment and subsequent fame directly contributed to a rise in women taking up swimming, with over 60,000 American women earning their Red Cross swimming certificates in the 1920s. Her success was a true inspiration for young female athletes, in a world where women had previously been seen as unable to compete physically against men. After a time touring Ederle spend much of her later years back in New York City, teaching children at the Lexington School for the Deaf to swim. She died in 2003 in New Jersey, United States, at the age of 98.